Batman is a classic franchise that has created generations of loyal fans. From comic books to TV to movies, Batman and all of the characters he meets have become household names – part of our pop cultured lives. But do you remember when Batman was fun and light-hearted? Sure, he was always chasing crazy villains, but the original TV shows and movies were still about having fun. The Riddler was one of those characters that captured our hearts – even if he was up to no good! Riddle us this Batman. What's green with question marks abound and wants to destroy the town? The Riddler! You can suit up as this Batman Forever version of him to give the role a try. Even if you don't have the exaggerated facial expressions of Jim Carrey, we're sure that you will have a blast riddling Batman left and right. If you toss him enough riddles, you might even distract him long enough for Two-Face to take him out for good! Just imagine how much fun Gotham will be without that darned Caped Crusader foiling your evil plans! 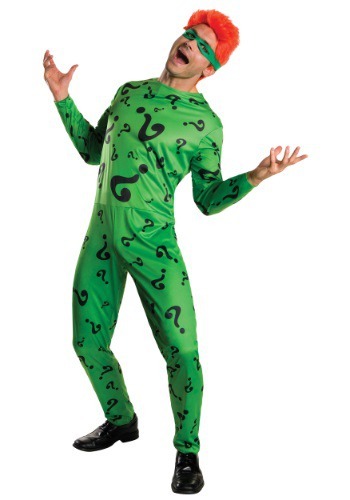 This classic Batman Riddler costume is perfect for Halloween – especially for a group costume! The costume includes everything you need for the look that’s straight out of Batman Forever. The 100% polyester jumpsuit is the classic green color and has black question marks printed all over it. The polyfoam mask ensures that you keep your true identity a secret. Don’t forget to add the Riddler wig – he wouldn’t be the Riddler without his signature red hair! Team up with other Batman super villains for a group costume that’s sure to get attention this Halloween!